Have Good Genes: Research has shown that genes play a role in the way our bodies distribute and store fat. So if you are having trouble with belly fat you might have your parents to blame. People with pear-shaped bodies tend to carry fat around the hips and thighs, and less likely to in their midsections. On the other hand, apple shaped people tend to carry fat in their midsections. Train Smart: While body shape affects the way you carry fat, a good training program will help you achieve the middle you want. With the right balance of cardio and strength training, all body types can get a strong, tight core. Cardio will help burn fat and calories. Varying the intensity level of your workouts will yield faster results. A high intensity work out helps burn more calories during and after the workout, but dont go too hard, as you want to allow your body to adequately recover and still burn the fat and calories necessary to lose weight. Strength training will give shape and strength to the muscles that define your abdominal area. This is what will give you the washboard six-pack abs you desire. A good regimen involves a workout that lasts 15-20 minutes, 2-3 times per week. 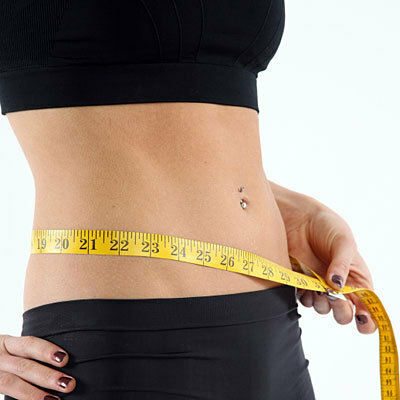 Eat Healthier: There is no real secret when it comes to eating for flat abs. You just need to eat healthier and cut down on junk food. To evaluate your diet, make sure you are eating the right amount of calories. A rigorous workout doesn’t justify over-eating. You can work with a dietitian or use an online calorie calculator to make sure your intake is appropriate. Its also important to make sure you are getting enough protein, scheduling your meals throughout the week is a great way to make sure you are eating healthy.